"June Foray in Suspense: Man Who Stole the Bible"
Part of Radio's success during the Golden Age was due to the proximity of the Los Angeles "Radio Row" to the movie capital. Although commercial radio got its start in New York and Chicago, by the late 1930s NBC, CBS, Mutual, and eventually ABC had studios and broadcasting facilities within walking distance of the corner of Hollywood Blvd and Vine St. Not only did this make it easy for movie stars to make an occasional appearance on the radio, it was convenient for up and coming stars to find work while they were trying to get their big break in pictures. Not all Radio Row players were anxious for the glamor and recognition that comes with film success. 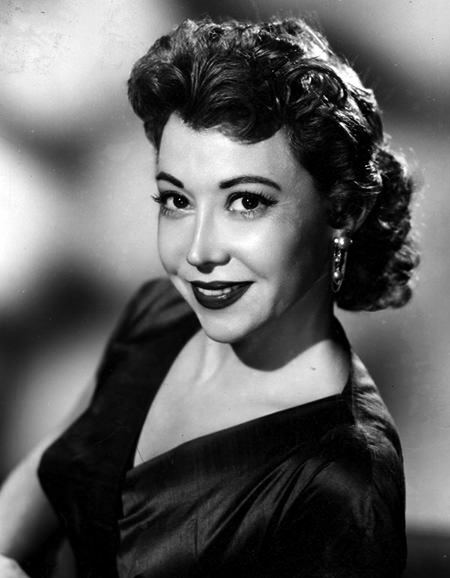 June Foray, for example, enjoyed a degree of movie success that most starlets would envy. Rather than having her face splashed across the screen and the tabloids, June capitalized on her voice talents to become "the cartoon queen". Born June Lucille Forer in Springfield, Massachusetts, 1917, her maternal grandfather was a Lithuanian Jewish immigrant who opened a successful show store. June had an elocution teacher who was interested in radio, and who hired the youngster to perform voices over WBZ at the age of twelve. By the time she was 15, she was writing and performing voices for her own show, Lady Make Believe. Soon after she graduated from Classical High School, her grandfather sold the shoe store and the whole family moved to Los Angeles. In California, June was soon appearing as part of the regular company of Lux Radio Theater and The Jimmy Durante Program. Like so many pretty young ladies living in and around Hollywood, she did a few screen tests and appeared in minor roles in a few live action films, but her real calling was voice work for the animated shorts and features which were gaining popularity. Although there were several masculine voices at the animation studios, June's specialty even as a teenager was "grandmother type" voices. She gave voice to Oswald, the Lucky Rabbit, a character created by Walt Disney and sold to Universal, in his last theatrical cartoon, The Egg Cracker Suite (1943), and she was soon working with another bunny at Warner Bros. June played Bugs' girlfriend Daisy Lou in Hare Splitter (1948), and created several other voices for the studio, including Witch Hazel and Sylvester and Tweety's Granny, but by contractual obligations, the only one to be credited was Mel Blanc. Animator Chuck Jones once stated that "June Foray is not the female Mel Blanc, Mel Blanc was the male June Foray." Disney used Foray to voice Lucifer the cat in Cinderella (1950) and decades later as Grandmother Fa in Mulan (1998). In the late 1950s, Jay Ward asked June to voice Rocky the Flying Squirrel for his pioneering TV program The Rocky and Bullwinkle Show. June played nearly all the female voices on the show, including Natasha Fatale. One animation house that June had a sometimes-strained relation with was Hanna-Barbera. She had done some work on the Tom and Jerry series and was asked to voice Betty Rubble in a pilot they were creating for what would become The Flintstones. The network bought the pilot but rejected Foray outright. The studio would not even let her retest for the part, which eventually went to Bea Benedaret. Eventually, Hanna-Barbera patched things up with June, who later played Cindy Lou Who in How the Grinch Stole Christmas (1966). Foray also provided the voice for Mattel's original "Chatty Cathy" doll. In her late nineties, June Foray still resided in Hollywood and took an active interest in the preservation of classic animation. Ms Foray passed away in her home in Los Angeles at the age of 99 on July 26, 2017 a couple months short of her 100th birthday. A Star on the Hollywood Walk of Fame at 7074 Hollywood Blvd was dedicated on July 7, 2000, honoring contributions to Television by June Foray. Be the first to comment on "June Foray"
Guest Star 501105 0189 Reginald Clippington T. T.